DIN rail is a common standardized way to mount electrical equipment on walls and in electrical boxes in an organized manner. In general, it provides a platform that a wide array of components can snap onto for easy assembly. 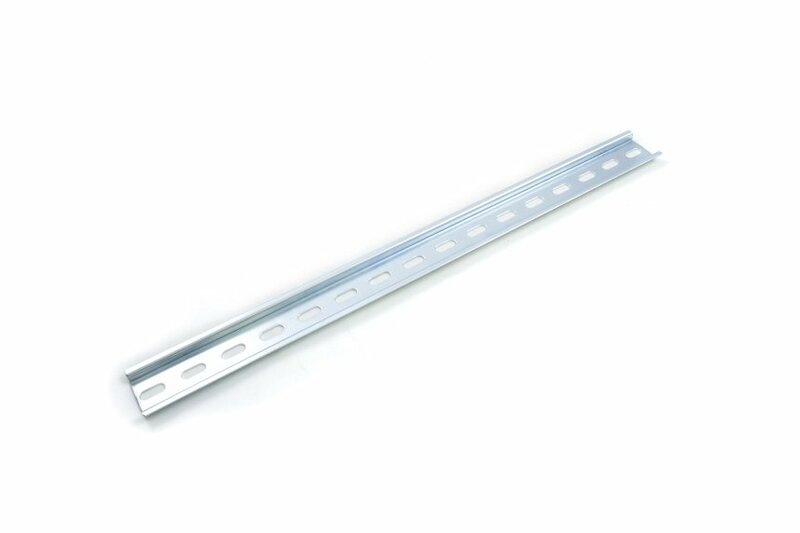 Phidgets carries 35mm DIN rail with cut-to-length ordering. 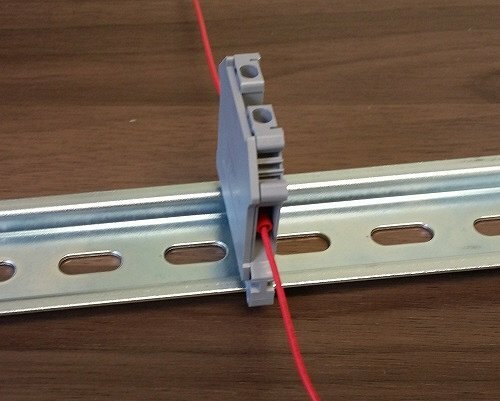 This article will go over common types of components that natively connect to DIN rail, and how to mount those that don't. Terminal blocks are a quick and reliable way to connect wires securely without the use of solder. Simply screw one or more wires into both ends to make a connection. 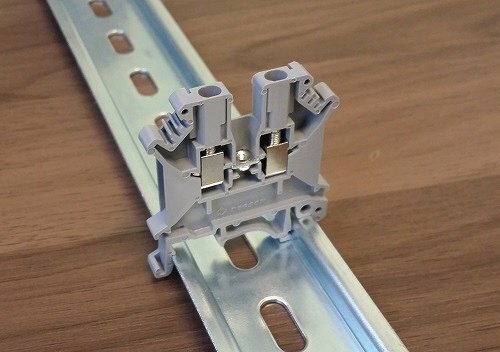 As with most things on a DIN rail, these simply click into place on the rail and are ready to use. Note that while the most obvious metal clamp may appear to be on the front of the terminal, wires should be attached through the sides of the terminal. Terminals can be strung together with a jumper bar to connect more terminals to the same node, for uses such as a power bus. If fewer than five terminals (or three terminals for the DIN4102) are to go on the desired bus, you may cut the jumper bar to length using side cutters. Make sure to use an end cap to protect the otherwise-exposed parts of the block. These should simply click into place. The terminals can be labeled for future reference using a plastic label strip. When using terminal blocks, it is recommended to attach ferrules to the end of your wires before putting them in the terminal to strengthen the connection. This serves both the benefit of improving the electrical connection, and preventing the wire from shearing off through movement. To use a ferrule, apply an appropriately sized ferrule to the end of a wire, and crimp the metal end. Multiple wires may be crimped into the same ferrule. Simply twist them together, and crimp them as normal. Power supplies are essential to any electrical system. Specifically, they regulate the voltage supplied by the mains into something manageable for other components. For more information about power supplies, please check out the Electricity Primer. 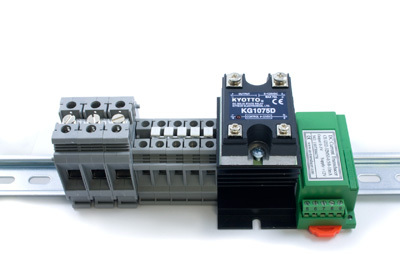 Relays are electrically-controlled switches essential to many control applications. Relay holders are also readily available in DIN rail format. Heatsinks are an inportant component in power systems to dissipate heat generated by components to prevent overheating and part failure. This heatsink slides into place from the side of the rail, rather than clicking onto it from above. Heatsinks like the 3955_0 supplied by Phidgets also serve as good mounting brackets for Hockey Puck solid state relays in addition to protecting them. There is a wide array of other types of industrial sensors that are compatible with being mounted on DIN rail. For everything that doesn't naively fit on DIN rails, there are adapters. 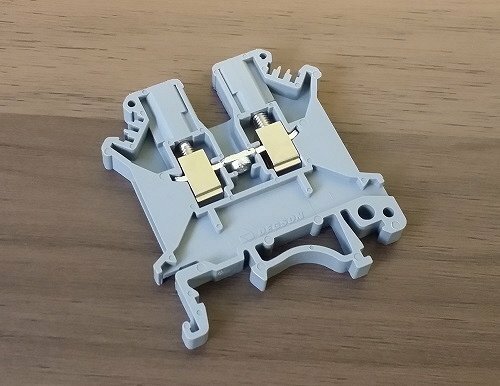 These can be used to attach any manner of things (such as Phidgets) to a DIN rail. To mount a Phidget to DIN rail, simply apply your favorite double-sided tape (or glue if you don't mind permanence) to the adapter and stick the Phidget in place. Multiple adapters may be required for larger Phidgets. If using Multiple DIN rail adapters on a single component, make sure they are facing the same direction, or you will be unable to mount it to or remove it from the rail.